This past year I have started taking on some interior design clients. 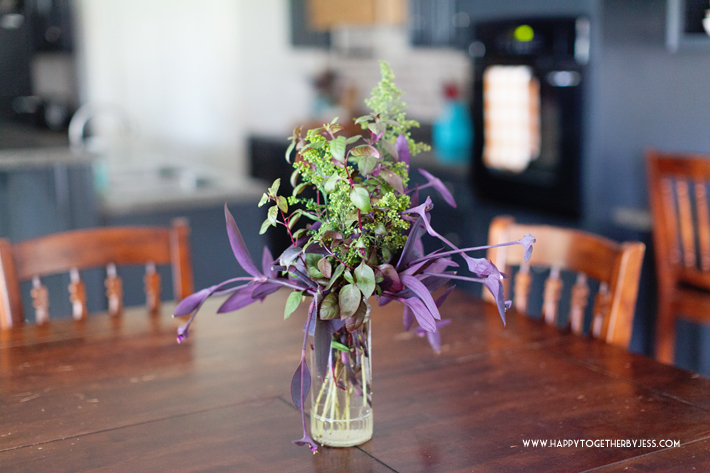 I love doing things well and on a budget (as has always been shown on this blog) and others have wanted me to help them do the same. 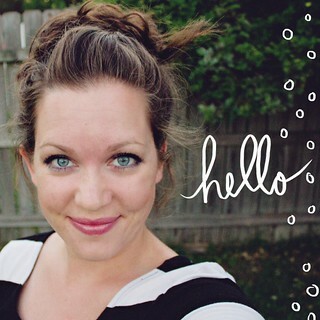 After helping with doing some big makeovers at my church (which I will also get blogged about one of these days lol), I began first working with a friend on her home. 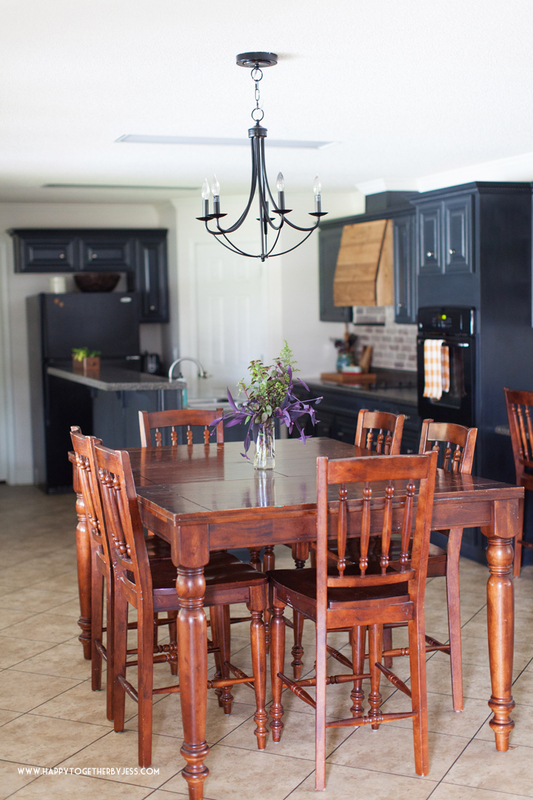 She wanted a change and loves the farmhouse look but it needed to happen within a budget. 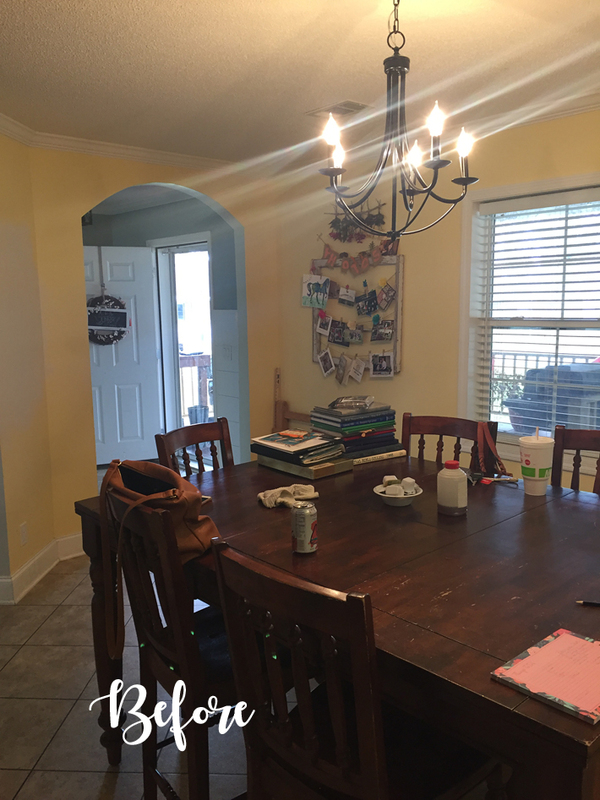 So I came over and we talked about all the different type of changes that we could do to make the biggest impact to give her space a farmhouse kitchen makeover. 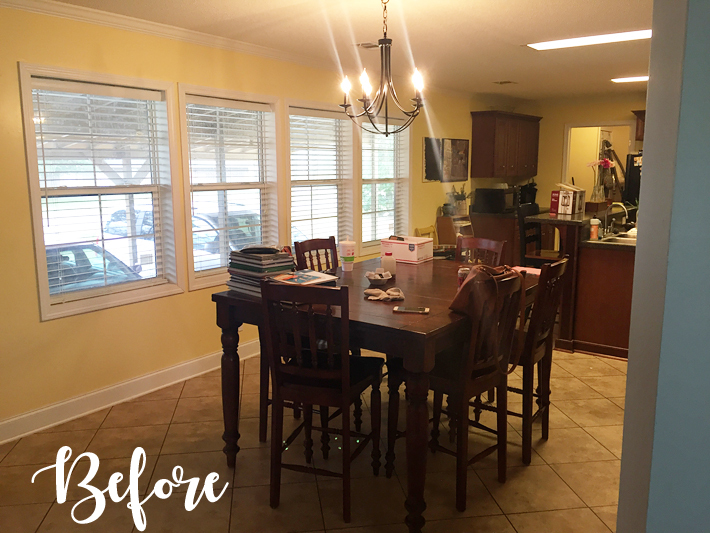 The main obvious and most cost effective changes were to paint the cabinets and walls, add a new light fixture, and install a backsplash. 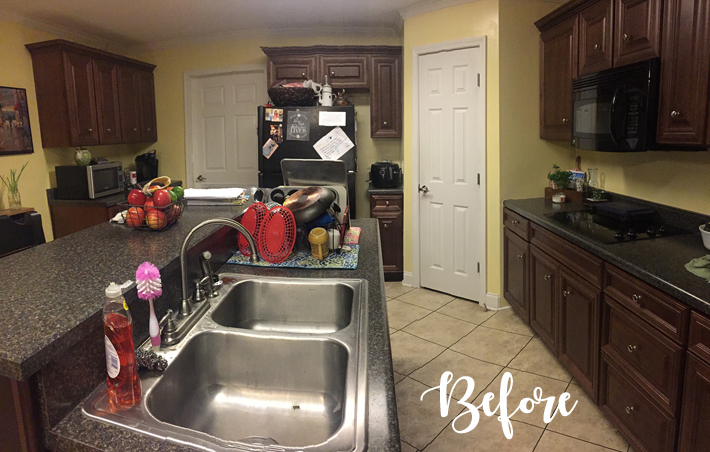 You can see in the “before” pictures below that the walls were a bright yellow, the cabinets were really dark, there was no backsplash, and well I didn’t get a picture with the old light fixture but it was your basic builder type. 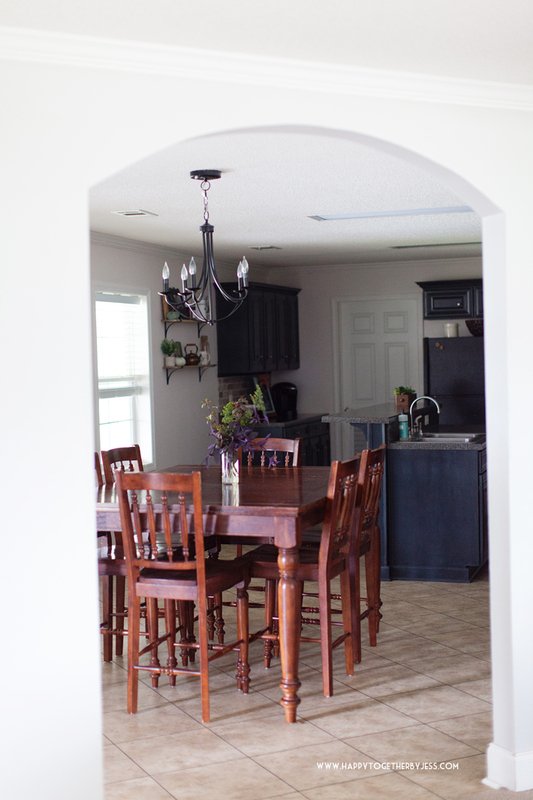 She really wanted to lighten things up, so I talked to her about the colors and undertones in her counter tops and flooring and what would be good to compliment them since those things would be staying. 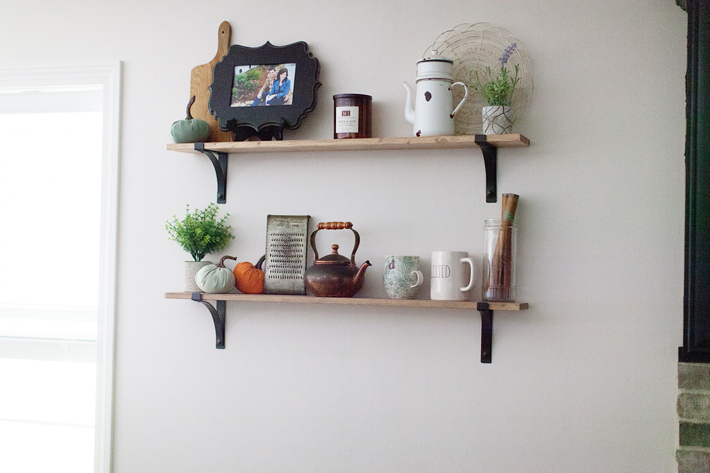 To have a less cluttered look, I arranged her shelving to hold things that she used but it looked nice as well. We did a lot of “shopping” of things she already owned. The only accents she bought were a few things of greenery. The backsplash was fun to install and took two days. 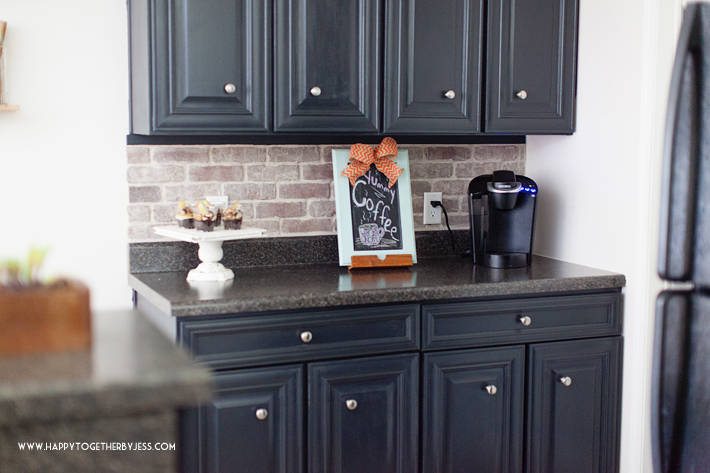 We used this brick veneer from Lowes and used construction adhesive to put them in place. I started at the bottom and worked up. 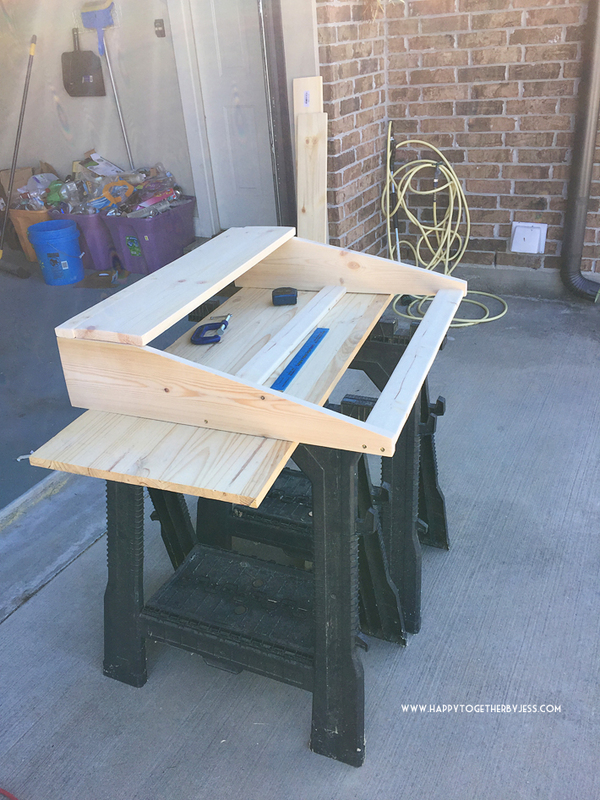 There was a small gap at the top, but I used wood trim to fill in the gap. 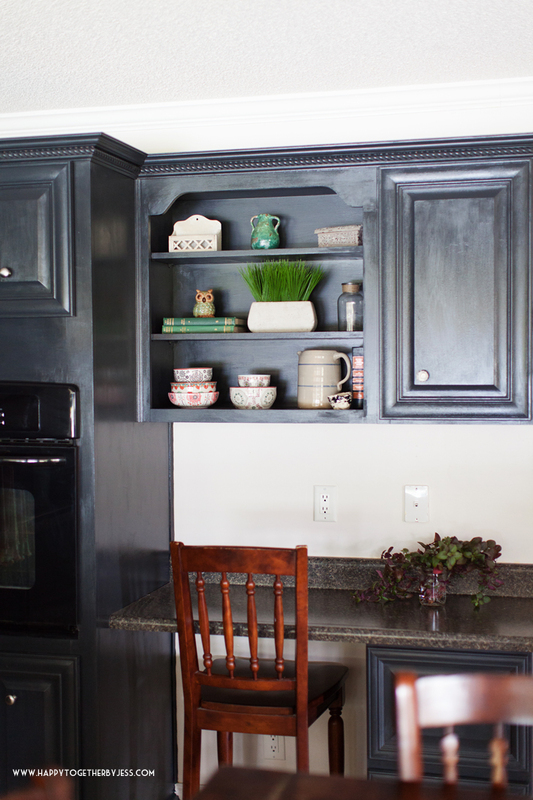 Since we painted the wood the same color as the cabinets, it looks like a part of the cabinets. I used a chisel and hammer to break the bricks where it was needed. 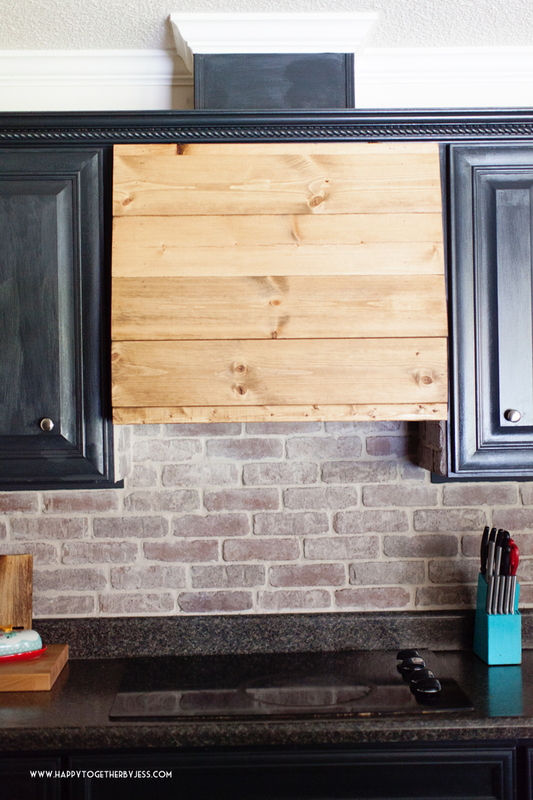 So that means anyone can easily do this type of backsplash without needing a ton of expensive special tools! For the “mortar”, I used this grout. Since it was a small area, we splurged a bit and got the premixed stuff which saves time and is always mixed correctly. 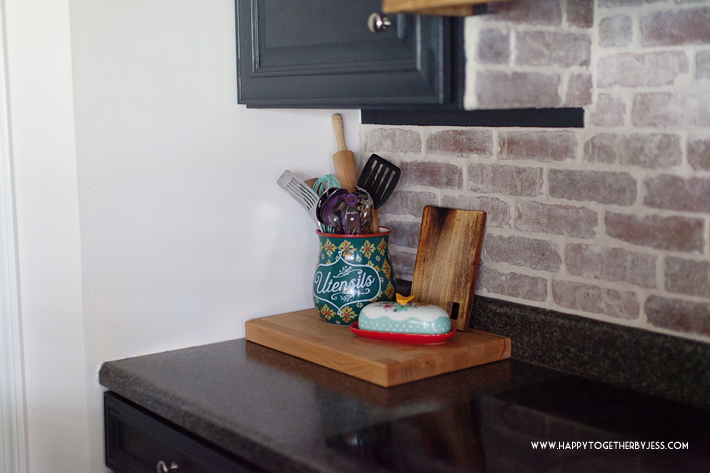 I used a grout piping bag, piped it into all the cracks, and every few feet took a break and used a wet sponge (squeeze excess water off first) to gently dab on it to fully fill in the cracks and smooth it out. Truly, so easy to do. These two tutorials (here and here) are good to look at, similar, but use a few different items in each one. We just need to add a sealant to the bricks and then it’s all done. There also used to be a microwave above the stove. Unfortunately, each of their boys have accidentally used it wrong and after going through two microwaves, they don’t want one and have found they don’t really need one. So I built a hood to cover the space and left room enough for them to later install a fan. 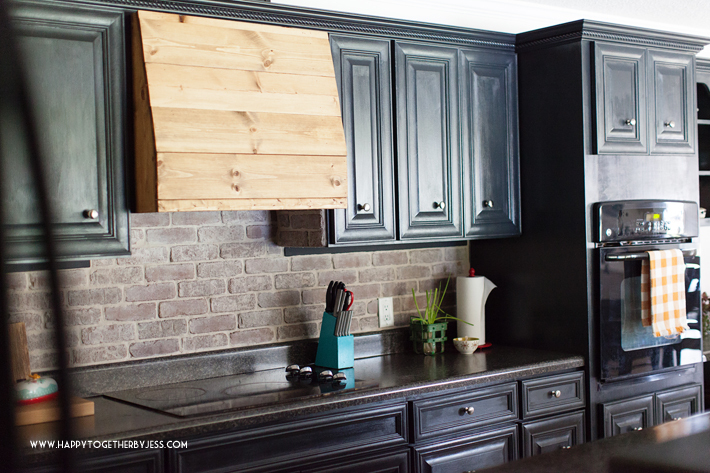 Since there is an outlet up there and storage, the top front of the hood is on hinges and can open. I forget to take a picture of that, but here is what the base looks like. Then those front pieces are the “door”. 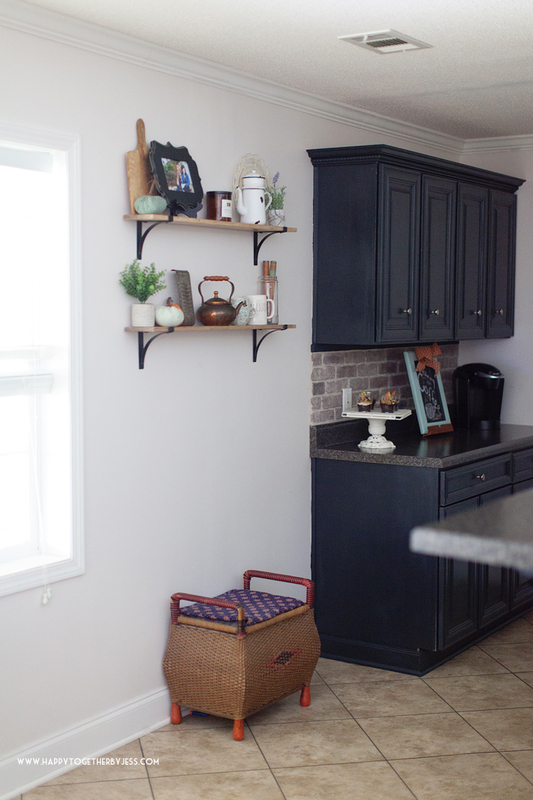 We continued the brick backsplash on the other side of the room and might go back and also do the desk area. 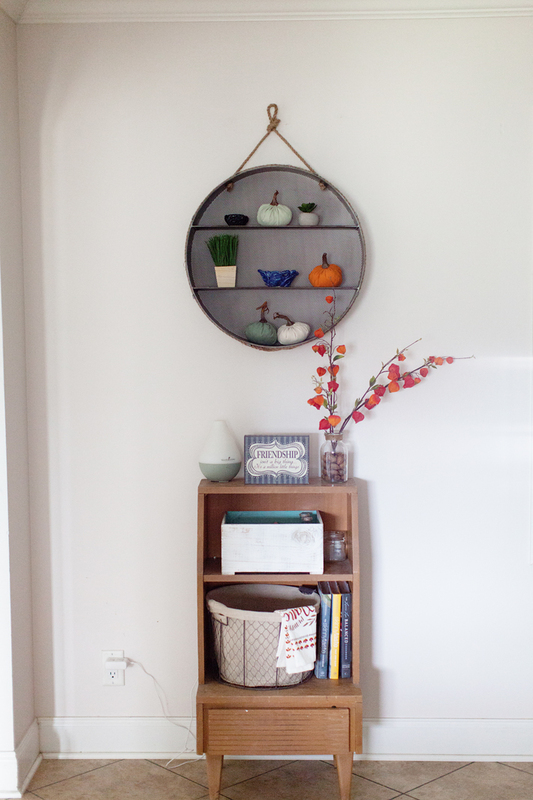 The cute shelves were a find from Target and the basket was gifted to my friend. Some of the items on the shelf are family heirlooms that are now proudly displayed. Now, let’s just talk about this chandelier for a minute. I discovered it on Target’s website for fifty something dollars. I thought for sure it would be a “too good to be true” deal, but after reading the reviews we decided to try it. It truly is a fabulous deal! It’s just as well made as ones I have purchased for much more money. And the size is really good for smaller spaces. I installed this myself and it was really easy to do. 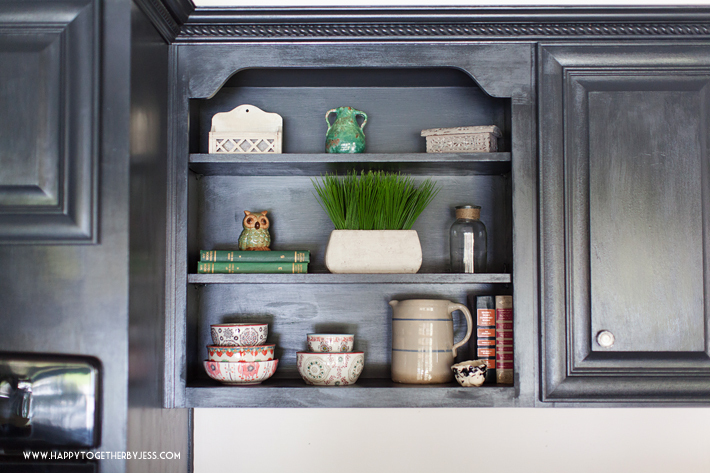 The biggest difference I see is that the finish isn’t as matte as more expensive chandeliers, but a can of spray paint can fix that if you find it an issue. It also comes in two other colors. 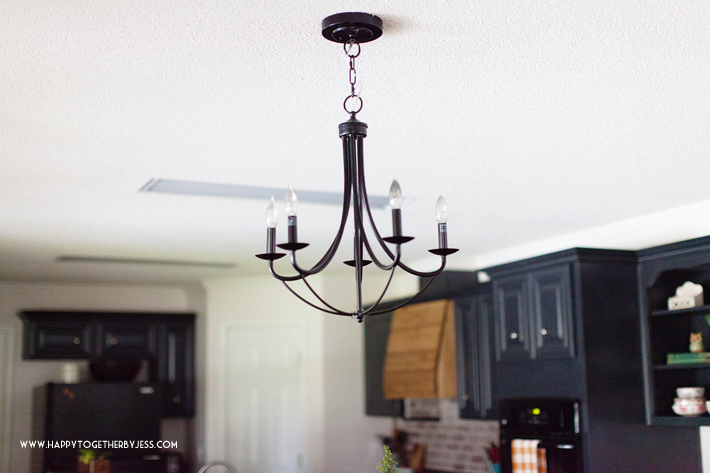 So if you’re on a tight budget this is a great farmhouse style light fixture to consider.